Check out the huge bundle theme sale from bbthemelab - One week only! If you're looking to add another theme to your rotation but can't decide on just one then why not go for an entire bundle? 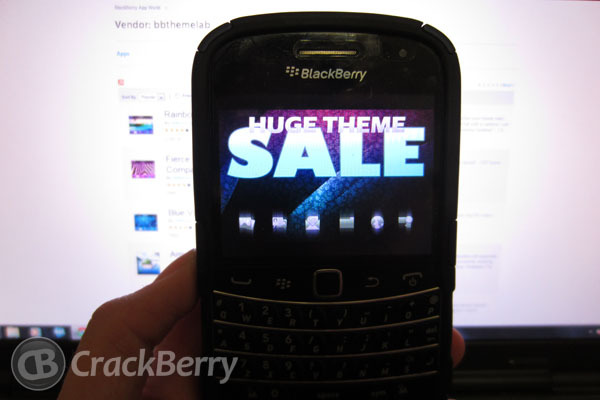 Matt over at bbthemelab let us know that they are having a huge bundle pack theme sale for one week only in BlackBerry App World starting today. This sale covers over twenty themes which includes some of their most popular designs for a wide range of devices supporting OS5 and higher. Were you itching to get your hands on MiniBar but couldn't choose a color? Do you feel the need to transform your display into a replica of Win8? Are there times you're in the mood for a simple OS7 theme? bbthemelab has you covered in all of these categories with these nine amazing bundles. Each and every one are high quality designs that are sure to satisfy all you theme addicts out there. This is one sale not to pass up so be sure to do to so before it ends. What's not to love about this offer? It features a great selection of themes and you're sure to find a one (or more) packs to suit your needs. To download, simply click on the links above or the BlackBerry App World link below. While you're picking and choosing your favorite bundles be sure to drop us a line in the comments below and let us know which ones you selected.